FPR has decided to focus our economic efforts in promoting our Island as a destination for the world by boosting the expansion of the Visitor Economy due to its short-term economic impact. Properly executed, this development offers significant benefits beyond economic impact. 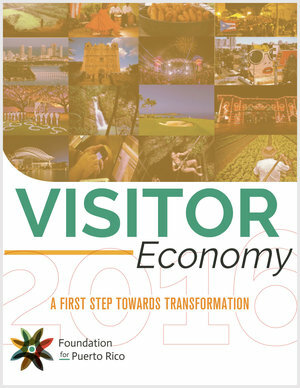 This Vision Document helps us understand the concept of the Visitor Economy, and why it’s important to develop to the largest scale possible, for Puerto Rico’s economic recovery. This document includes an evaluation of the sector’s scenario and its global and regional tendencies. Likewise, we try to understand and document our current capacities and activities, our practical strategies, and our successful practices to propose a way for uniting efforts with updated knowledge, and therefore build a visitor economy large enough to have the results we need and deserve.